The following materials are written by two highly respected Finnish institutions. 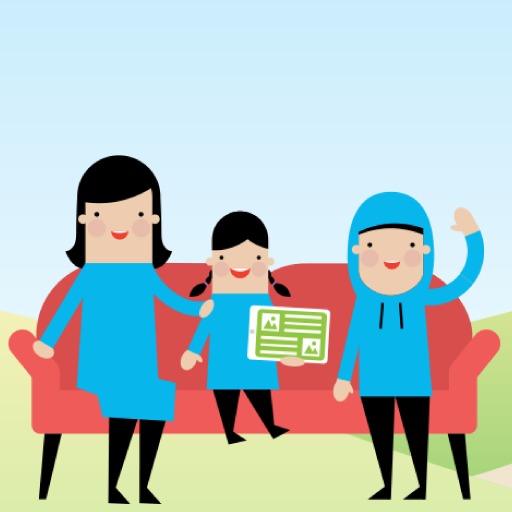 Mentalhub (Mielenterveystalo in Finnish) is an online service which offers information, support and treatment related to mental health and psychological well-being for adults and youth. All materials are intended for refugees. These materials aren’t specifically intended for young people but they are useful connected to young adults at the age of 18-29. 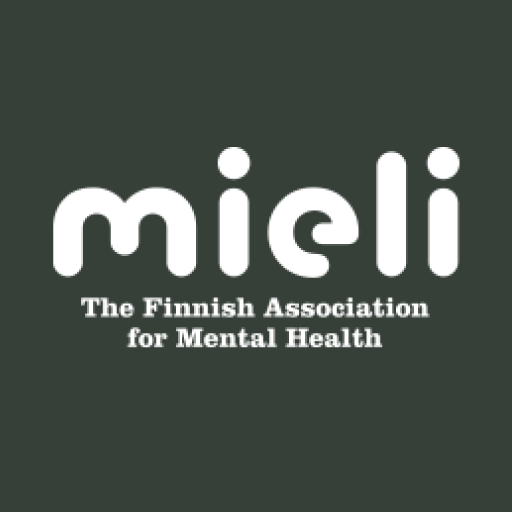 Mind (Mieli in Finnish) – The Finnish Association for Mental Health: Founded in 1897 FAMH has worked in mental health field as an innovator and inspirer. The WHO (2013) defines mental health as a state of well-being in which every individual realizes his or her own potential and can cope with the normal stresses of life. She or he can work productively, and is able to make a contribution to her or his community. 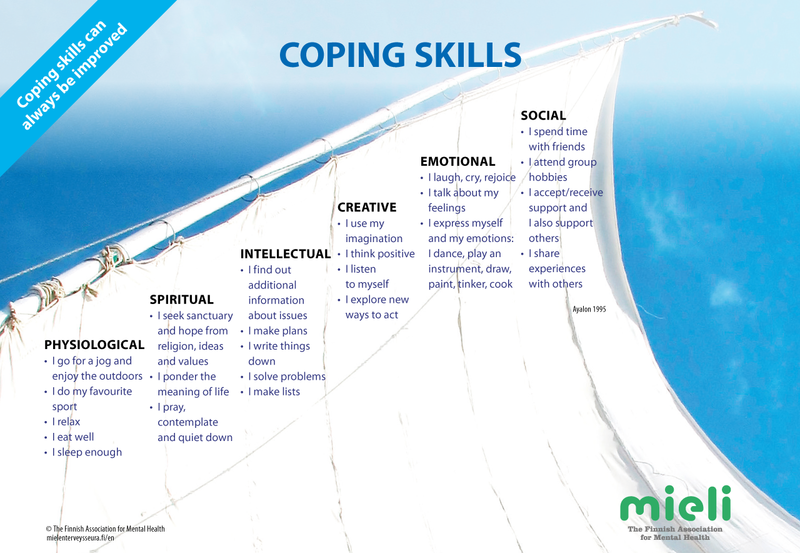 It is beneficial and rewarding to develop mental health skills. Our website provides information and exercises for this as well as survival stories. 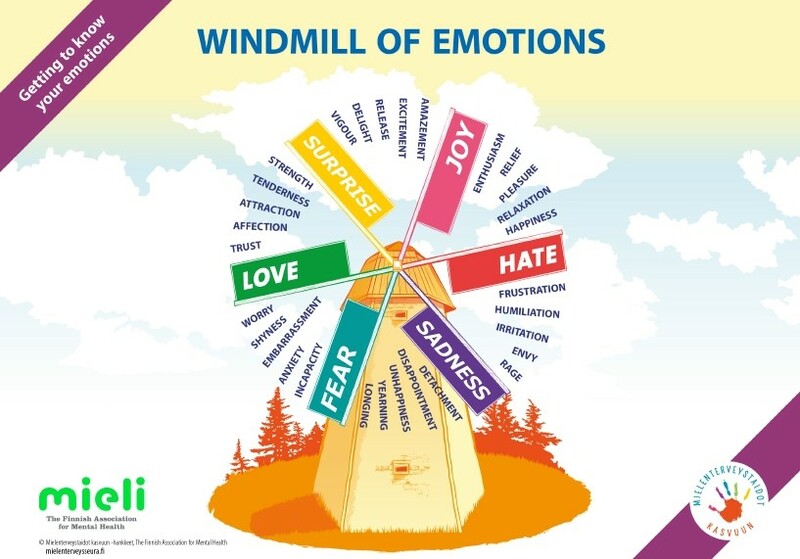 Many external and internal factors protect mental health. It is important for all of us to develop these. This part includes practical advice, how a person´s everyday actions can influence their well-being and improve it. It is important to think about how one copes in the best possible way in life-changing situations and what one can do to ensure they can carry on. 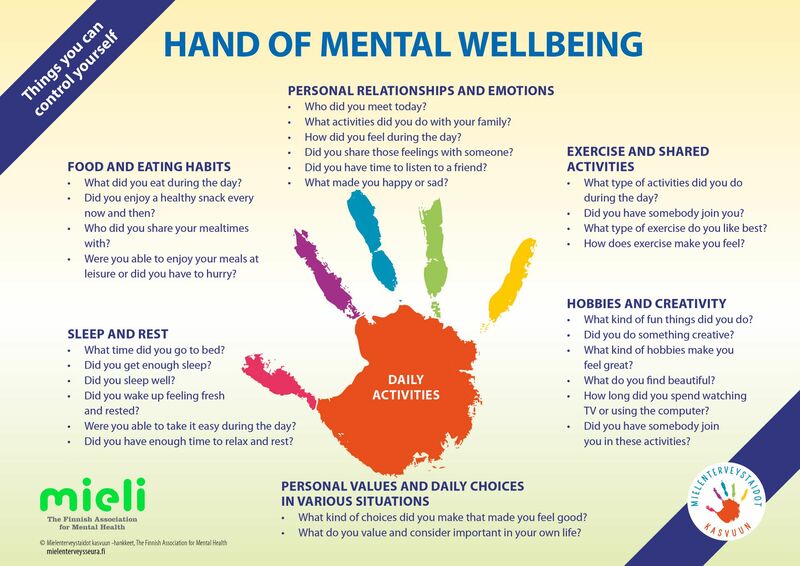 Daily well-being is connected to mental well-being. When a person’s life is in balance, everyday life flows without big worries. Daily routines give rhythm to a day. In addition, one can influence ones well-being by very simple, daily choices. Through these things you can consider how your everyday life rolls on. Which of these you already take care enough? Which not? What things could you change to make ordinary day to in a more positive way for you? A person can influence one´s well-being by very simple means. These things promote both, mental and physical well-being. It is especially important to try to take care of daily well-being, because it helps to maintain both mental and physical well-being as well. Any activity enhances the feeling of life control and well-being. An activity does not need to be anything big. That is possible according to one´s resources, abilities and chances. Participation in work societies and hobbies, studying, social relations and physical exercise are examples of meaningful activity. A person´s natural need for sleep varies individually. A healthy adult needs approximately 7 to 8 hours sleep at night. Good quality sleep is important to a person, because sleep is closely connected to one´s mental and physical resources. The most common cause for a sleeping disorder is stress and changes in environment and life. Disturbance of sleep affects the body and mind in many ways. Bad quality sleep weakens the mood. Long-lasting insomnia causes irritability and mood changes. Insomnia also weakens the ability to concentrate and learn, as well as functioning of the memory. In addition, insomnia also exposes to many physical disorders as well: long-lasting sleep deprivation may expose, for example, to higher blood-pressure and cardiovascular disease. Because of these reasons it is important to look after the things that guarantee good sleep or at least decrease insomnia. Avoid or restrict coffee, alcohol and cigarettes. If you wake up in the middle of sleep, get up and do something calming. If sleeping disorders continue, discuss them with a doctor or community health nurse. The brain is a vital organ for human functioning. Nutrition has a major meaning for mood and energy. By eating a human being gives energy to the brain and body. Nutrition improves concentration, coordination, motivation, memory and stress tolerance and maintains the performance. Regular eating routine also gives rhythm for the day. Regular eating routine also affects blood sugar balance and energy level throughout the day. In addition to eating, it is important to drink enough fluid. An adult should drink about 1.5 to 2.0 litres of water per day. Physical exercise has been found to have several health-promoting influences. In addition, exercise can decrease symptoms of depression and anxiety and turn the attention away from negative thoughts. That is why a person can maintain physical and mental well-being through regular physical exercise. Regularity is important with training: at least half an hour of exercise every day. Regular exercise also helps falling to sleep. Making new social relations in a new country may feel difficult at first, especially not having a common language. However, it is important to bravely go out and learn about the new environment. One can find new friends through the studies, work, hobbies and other societies or clubs. A person’s own family and relatives are also important social connections. Support from others and talking to them also relieves stress. Thoughts about the past and future can circulate on one´s mind: recalling the past may also be distressing and raise the feelings of homesickness and longing. On the other hand, the future may feel uncertain or even scary. It is important to learn consciously calm down one´s mind and thoughts. It is important to live in the moment and recognize, that the environment around is safe. It is good to seek out things for the future, which bring dreams and wishes to mind. Even the smallest exercises, which may relax the body daily can help moving forward. All in all, it is good to do things you enjoy: for example moving, talking and listening to music. You can do things you like or reward yourself, for example good food or small shopping. You can also praise yourself when things have gone well. Reflect how could you use these materials with migrants / refugees / asylum seekers? Immigration can be described through five stages. However, the experience is individual for every person moving to a new country. Arriving in the country usually represents a very positive and hopeful time. The differences in the culture are not a hindrance, but rather a fascination. Excitement, relief and gratefulness are typical feelings at this stage. The hopes and expectations of those arriving are usually high and their faith in learning the language and finding a job is strong. Usually, they also have plenty of energy to actively arrange all necessary matters. The hopes and expectations may be partially unrealistic. For instance, it may seem that there are no problems whatsoever in the new country. This is a result of either denying the difficulties or closing one’s eyes to them. The positivity in viewing the new environment is as a result of the willingness to find proof that leaving was the right choice. The attitude towards the new country becomes more realistic when the person has stayed in the country for longer: ordinary problems of living are present everywhere. The weak points of Finland and the Finns become visible. It is difficult to access education or get a job. The home country begins to feel good in all ways and the new country starts to feel wrong. At this stage, the person often feels bad and suffers from different conditions. The feelings of loneliness and disappointment are typical: Maybe it was not worth coming here? Did I make the right choice? The insecurity of the future and lack of routines cause stress. In the new situation, every single thing needs concentration, which takes energy. Psychologically, this is very consuming. At the same time, one should find new relationships to replace their family and friends. A suitable job may not appear right away, and accommodation, money and food may also cause trouble. Usually all this evokes strong reactions and emotions that may even feel terrifying. Many describe having been completely surprised by the force of their own emotions. Emotions, even strong ones, are however an understandable and normal part of adaptation. Usually, it feels comforting to know that the negative feelings are part of the normal immigration process and that this stage will also pass. Sometimes people are afraid that their own personality has changed permanently; that the negative reactions and feelings will remain part of them forever. This is not the case. The stage can be lived down by processing the thoughts and emotions. Leaving the issues unprocessed may result in a deep crisis or depression. Little by little the newcomer begins to see positive details in the new country and the attitude towards the future is more optimistic. The faith in surviving despite difficulties is returning. The person is beginning to have courage to invest in living in the new country at the emotional level as well as at the level of actions. They start, for instance, to form more stable friendships and to plan buying an own home. Long periods can pass by without thinking about the relocation. Therefore, it may come as a surprise to many refugees that for instance events and incidents taking place in their old home countries cause temporary regression in the immigration process. The strength of the reaction may depend on the distance to the home country and the visiting opportunities. For refugees, safety may be an obstacle, while for other newcomers, money might be a hindrance. It is important to remember that the regression is temporary and the journey forward continues. The fundamental emotion at this stage is most often sorrow which also takes the form of home sickness. Mourning is natural, even essential. One has to give up the past in order to move on. Only after grieving over all that was lost, one can look to the future and all the opportunities the new country offers. Grieving is a sign of being ready to move on. One’s own life history will be converted into a strength and memories into riches. At this stage of the process, the person begins to notice the positive things about immigration. They master the knowledge of two cultures and know how to act in each of them. Two cultures make the life richer and provide new opportunities. The person has adapted. Ordinary joys, sorrows and calm periods are part of their life again. A person may also get caught in different stages of the immigration process. If they continue feeling bad for a longer period and feel that they cannot move forward, it is advisable to seek help. A forceful culture crisis, too, will pass when it is actively processed. Finding professional help is not a shame. It is always good to search for help if feeling bad becomes chronic. Some people have experiences of traumatic events. A trauma may be individual, such as a difficult childhood experience, or collective, such as persecution or war. The traumatic experience is often connected to strong feelings of helplessness, fear and terror. This may result in a post-traumatic stress disorder, the symptoms of which complicate the process of adaptation. In such cases, the traumatic event will be recurrently and uncontrollably recollected through mental images or thoughts, which causes anxiety. A stimulus reminding of the traumatic event may result in strongly reliving the events all over again. The person tries to avoid any situations where this might take place. This will complicate taking care of everyday matters and makes it difficult to be in other people’s company. The person is constantly on the alert and apprehensive and keeps avoiding close relationships. Irritation and outbursts of anger are common. This may lead to isolation and loneliness or to conflicts within the family. A trauma is often accompanied with severe sleep disorders as well as memory and concentration problems. These affect the ability to function and learn and thus complicate, for instance, acquiring language skills or working. The person may experience that their chances of influencing their own future have significantly narrowed. Their feelings are easily hurt and they interpret the messages from their environment in a way that is unfavourable for them. They may have extreme difficulties in trusting others. Even though the past cannot be changed, it is possible to learn to live with traumas. Information about crises and mental health problems in Russian, Somali, Kurdish-Soran and Arabic languages.